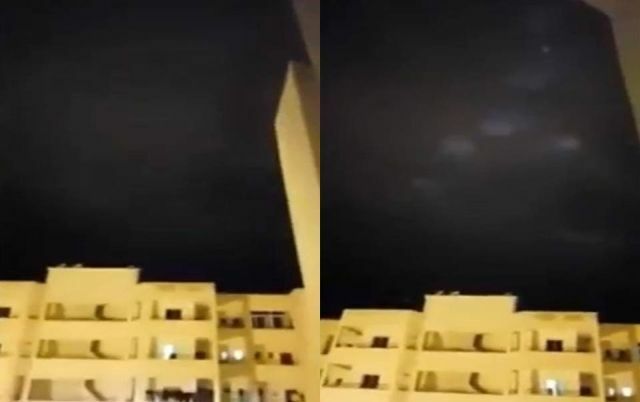 Witnesses in Meknes, Morocco spotted strange lights in the night sky above the city in what can only be described as a UFO sighting. The video shows several large glowing orbs hovering in the night sky and swirling around each other. Some social media users pointed out the lights seem fake, but it would be extremely difficult to take such a video without high tech CGI programs and a lot of animating skill. The orbs first seem swirl around one another, some of them are very large while others appear as smaller points of light. The most bizarre part of the video is at the end when all of the objects dart off in one fluid motion. There are no aircraft or animals which can maneuver with some speed and fluidity. So precisely what are these strange glowing UFO's? Some Ufologists would describe the objects in this video as "light ships" or ships that are capable of phasing in and out of different dimensions. While the craft may be physical, when they are in another dimension they would appear to be simply made of light to us Earthlings. The sighting is reminiscent of another video filmed in Jerusalem which shows a glowing orb shoot away at high speeds. Some claim this video was debunked as a student film project while others who have analyzed the footage say the images were most certainly present in the original video. What do you think these UFO's are? Is it a hoax, alien lightships, or evidence of a more Earthly phenomenon we have yet to understand? The lights in Morocco are searchlights playing on a cloud. Pretty Cool. The light over Jerusalem is not the spirit of Allah, but the landing lights of El Al. lah lah lah. You dumb dumb fkers, lights from down below. Seen this too many times at carnivals and night promo events.